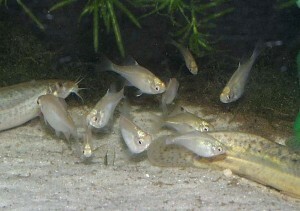 Like many other small fish species from temperated zones, bitterlings are very well suited as pets in home aquaria. First of all, they are small fishes (6-12 cm) with an extraordinarily interesting behaviour and often with beautiful colours. 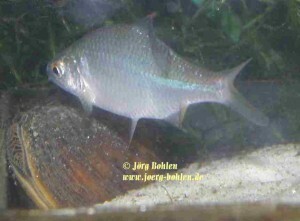 These inhabitors of warm, standing waters do very well with common room temperatures (20-25° C0 and a normal filtration. They are peaceful against fishes of different kind (even though males are territorial and can be quite aggressive against other bitterlings, but usually keep calm against non-bitterling fishes). Bitterlings can be fed with all kinds of dry, frozen or live food offered for aquarium fishes and do not show other unnice habits, like plant eating or digging. This wonderful guy on the right is a male of Rhodeus rheinardti from Vietnam. The left picture shows a juvenile specimen. Like in most bitterlings, the juveniles bear a black dot on the front margin of the dorsal fin. But in R. rheinardti there are two white patches, one above and one below the typical black patch. It was a big luck, that Jörg Freyhof and Fabian Herder brought a bitterling from Vietnam and offered me some offspring. According to them, the species was Rhodeus rheinardti, a species which was already scientifically described in 1883 by Mr. Tirant. 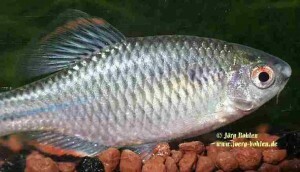 The catching locality is located within the tropical zone, therefore this vietnamese bitterling is even better suited as pet in warm water aquaria that other species. In my opinion, R. rheinardti is a very beautyful species, which ha s the perfect size for an ornamental fish. since the males reach maximal 8 cm total length and the females 6 cm. 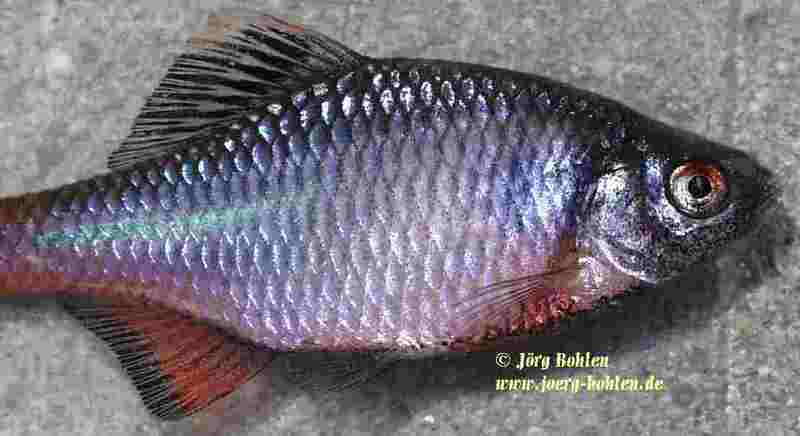 Males differ from females in the more intense coloration, the enlarged dorsal fin, the two groups of white tubercles on the nose and the lack of an ovopositor. When kept in aquarium, this bitterling turned indeed out to be highly tolerant against water temperatures and did not show any sign of uncomfort at temperatures between 12 to 30º C. Just the bright coloration of the males and the length of the ovopositor of the females develop above 20º C, best after an increase of temperature. 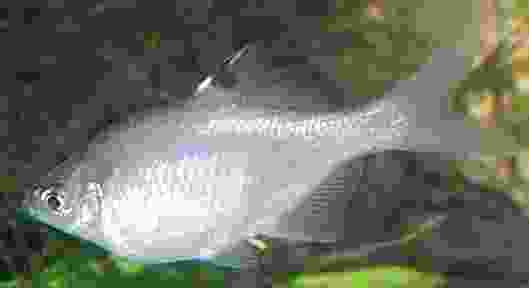 Strong increases in temperature can bring the fishes into spawning mood at all seasons of the year, showing this species to be independent from photoperiod as external trigger for the reproduction. 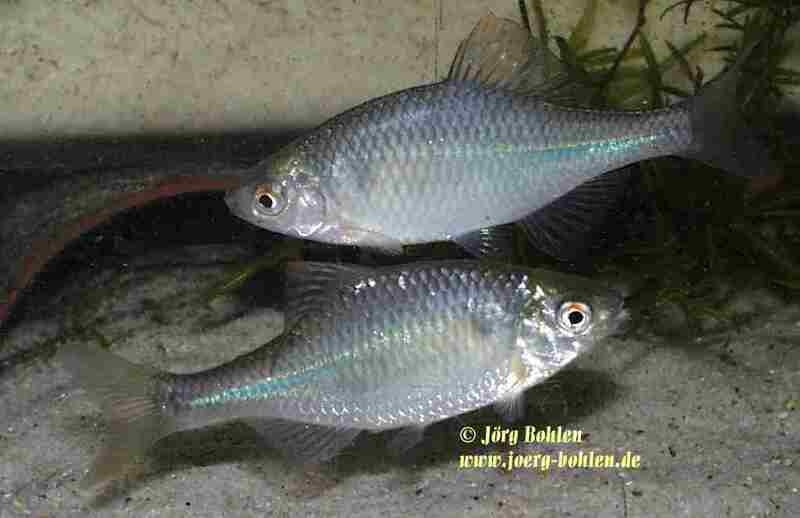 In my aquaria, the fishes spawned willingly into the European mussel species Anodonta anatida and Unio tumidis. When live mussels are not available, the species spawns also into a self-constructed artificial mussel (this is the shell of a mussel which by silicone and small water currents is imitates a real mussel). The mussle(s) should be replaced regularly, since a too high number of eggs inside decreases the success of developing for the embryos and since emerging juveniles could be eaten by the adult fishes. Rearing of the freshly emerged juveniles works well with Artemia nauplii and powdered flake food. 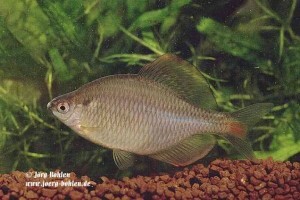 In my aquaria, R. rheinardti reached an age of three years, which is slightly more than I am used to in the European bitterling. A group of bitterling juveniles from China, as they are adult now they turned out to be Rhodeus ocellatus. The juveniles have a dark plotch in the dorsal fin and a white mark below, but not above (different from R. rheinadti). And here two pictures of male Rhodeus amarus from northern Germany. In this stock, males have very few nuptial colour, on the left picture you see two males imposing and on the right picture a males above the mussle. They are rather fade, aren’t they (May 2004)?